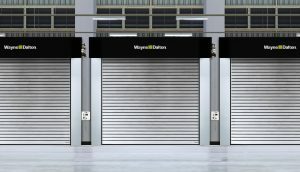 January 25, 2019 – Wayne Dalton, a leading manufacturer of residential and commercial garage doors in the United States, has expanded its commercial product offerings to include two new high speed doors — Models 888 ADV-X and 889 ADV-X. Ideal for applications that see heavy use, such as auto dealerships, parking garages, and manufacturing facilities, Models 888 ADV-X and 889 ADV-X operate at up to 80″ per second for maximum efficiency and feature a helical design that requires minimal interruption for maintenance. Wayne Dalton, a division of Overhead Door Corporation, is a world-class designer and manufacturer of residential and commercial garage doors. Wayne Dalton is known as a proactive business partner for its dealers, providing a wide breadth of innovative, easy-to-install products and smart sales tools to help grow their business. For consumers, Wayne Dalton simplifies the purchase process by providing a full range of doors and styles through conveniently located dealers. For more information, visit www.Wayne-Dalton.com.